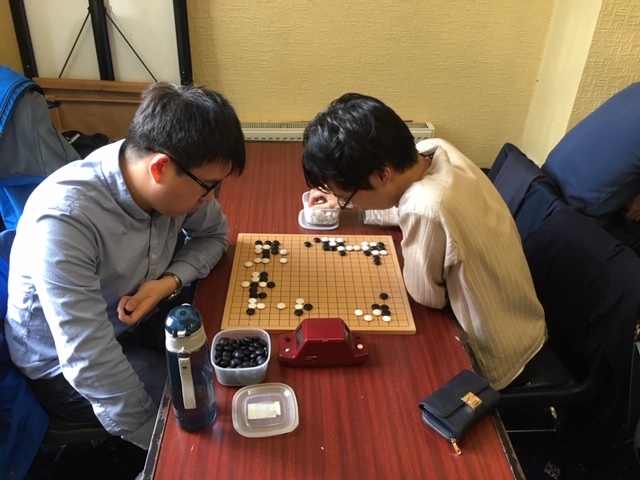 In stark contrast to last year’s beasting, the 2019 Irish Go Congress took place last weekend in Dublin under clear skies. 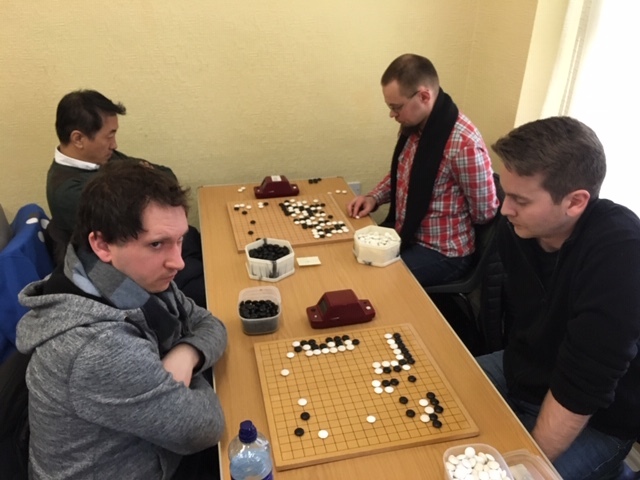 The Congress returned to its old home of the Teachers’ Club in Parnell Square, the scene of countless previous tournaments. 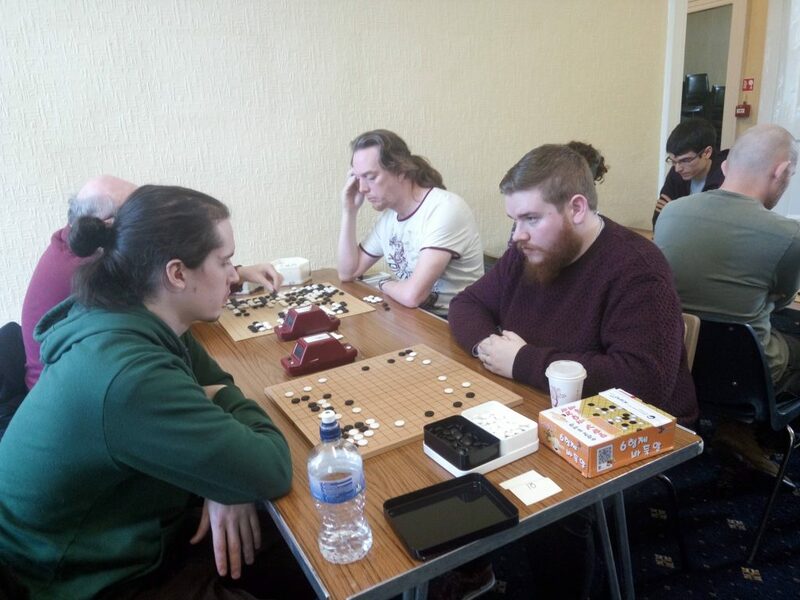 Forty-two players competed over the course of the weekend, with visitors travelling from the UK, Norway, Sweden, Denmark, Germany, Romania, and Poland to join a large local contingent. Saturday morning saw an event without precedent in the history of Irish go — the first round of the Open started two minutes ahead of schedule. There were nineteen boards in the first round and the bar was set at 2 dan. 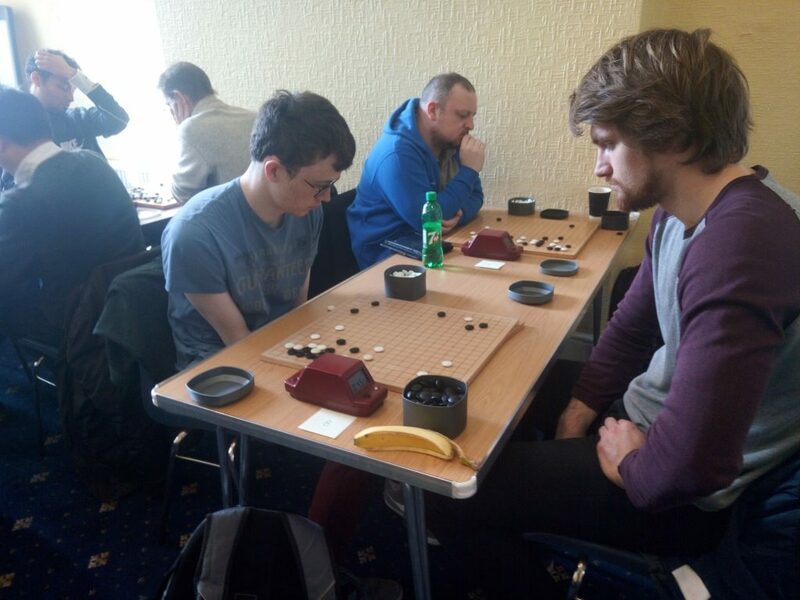 By the end of the day, Tunyang had already taken his place at the top of the table with a third round win over Yishen Wang 5d, while Mathis Isaksen was in third place. The top three placings remained the same for the rest of the weekend. By seven, most of the players were upstairs in the Teachers’ Club bar. We had dinner on the Parnell Street strip (six Chinese restaurants next door to each other). While we ate Matei Garcia entertained us with an apparently improvised comedy routine entitled “Why don’t we hold the European Go Congress in Dublin?” Tears rolled down our faces every time he repeated his catchphrase “No, I’m serious”. We were still joking about it some hours later over pints in the back room of Mulligan’s pub. Games started no less punctually on Sunday morning. The morning sunlight streaming through the windows lent the room an almost devotional ambience that was only emphasised by the lively evangelical religious service audible through the walls of the adjoining building. Tunyang finished out his tournament with wins over Mathis Isaksen 3d and Andreas Goetzfried 4d to complete his fourth consecutive tournament with a clean sheet. After the prizegiving and closing remarks, visiting players were allowed to enjoy themselves while Irish residents were herded into the Irish Go Association AGM for another ninety minutes of convoluted wrangling. Fourteen people made it to the closing dinner at the Kimchi Hophouse, where Arthur Cater entertained us with feats of legerdemain while Tunyang tried to demonstrate conclusively that the game on a 7 x 7 board should always result in seki. And with that the Irish Go Congress concluded for another year. Posted by Eoghan	on Sunday, March 31st, 2019 at 4:40 pm.